Propolis is a bee-keeping product of increasing interest as it has been used widely in food industry as well as in cosmetics; while its chemical composition is highly variable and depends mainly on the local flora as well as the geographic and climatic differences in the collection sites. Therefore it is necessary to characterize propolis, chemistry in order to confirm quality and safe use. As a part of our systematic research on different propolis from all over the world, we report in this study the chemical analyses of two Euroasian samples from Armenia and Georgia respectively, which to the best of our knowledge have not been studied before. All chemical analyses were performed by GC/MS using silylation procedure1. According to our results, both samples showed the characteristic identity profile of a typical propolis from Temperate zone2, as they contained mainly aromatic acids (p-coumaric, caffeic and ferulic acids), esters of phenolic acids (pentenyl and phenylethyl caffeates), flavonoids and chalcones (galangin, pinocembrin, pinobanksin and its 3-O-acetate, as well as pinocembrin, pinobanksin and pinostrobin chalcones). Furthermore, their total phenolic content was determined by the Folin-Ciocalteu method showing comparable high phenolics in both samples, which is in accordance with the results from GC-MS analysis. The ethanolic extracts were also assayed for their antimicrobial activity against nine human pathogenic bacteria and fungi, showing an interesting profile, while they exerted a more specific activity towards the Gram positive studied strains. Acknowledgments: The authors would like to thank Prof. Alexander Panossian (Head of Research & Development – Swedish Herbal Institute, Sweden) for providing the Armenian propolis sample. 1. Popova Μ., Chinou Ι., Marekov Ι. and Bankova V. (2009). Terpenes with antimicrobial activity from Cretan propolis. Phytochemistry, 70: 1262-1271. 2. Bankova V., de Castro S.L. and Marcucci M.C. (2000). Propolis: recent advances in chemistry and plant origin.Apidologie 2000, 31, 3-15. ISNAD PETROPOULOU, Argyro , CHINOU, Ioanna , GRAIKOU, Konstantia . "Qualitative Analysis and Biological Evaluation of Propolis from Armenia and Georgia". 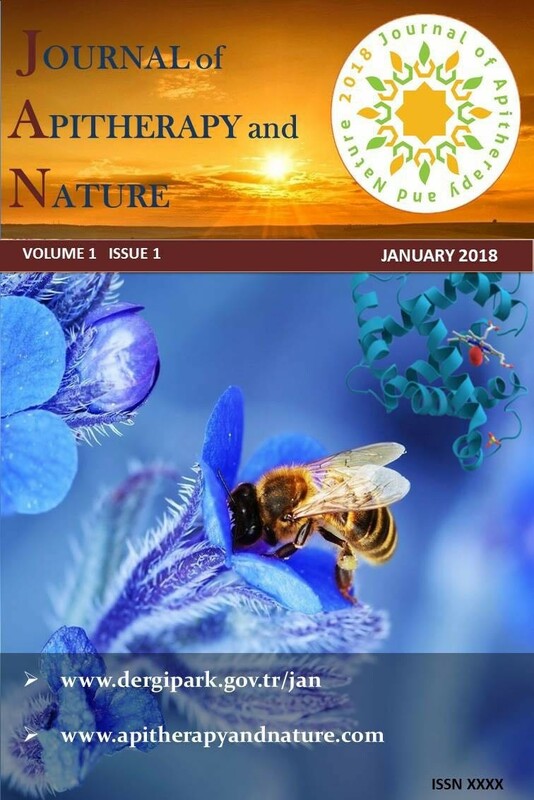 Journal of Apitherapy and Nature 1 / 3 (December 2018): 61-61.